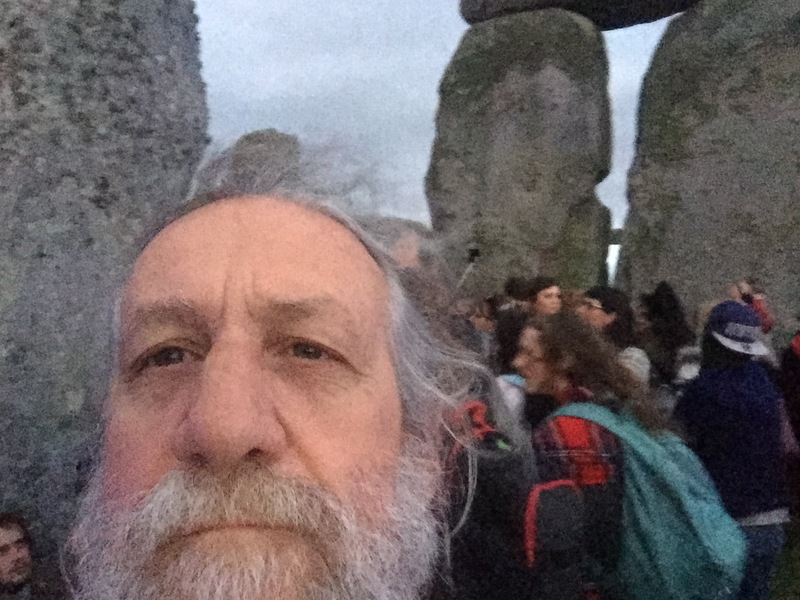 This was second visit to Stonehenge. The first time, I was the typical tourist standing behind the low fence marking the boundary of holy distance. This visit (2015) was during the Summer Solstice, and 23,000 other people were there to celebrate the Solstice with me. Stonehenge was larger than I thought. The distance behind the fence distorts the immensity of the stones. Standing under them, my own smallness was exaggerated, not unlike the experience of staring at the stars at night and contemplating the vastness of the universe, but this was closer and more personal, and I was not going to be taking a stone home as a souvenir. We arrived at the stones about 10pm on the evening before the rising Solstice sun, after a shuttle ride from the campground 3 miles away, where we had been staying and making friends the previous three days. The walk from the parking lots and visitor center to the stones is a mile and half. We were surprised to find half a dozen food vendors partway along the path, and a Gypsy caravan with acoustic music performing nearby. Once we arrived at the stones, I went straight for the middle. Having opened at 7pm, it was already crowded, and access to the drumming in the center required the patience and stealthy movement of a concert fan pressing forward to the stage. After about 45 minutes, and conversations with some notably interesting people, I was standing among a circle of drummers, wishing I had a instrument. Drums beat, people bounced up and down, or swayed in minute movements. The press was too tight for more than a little wiggle, and it was almost difficult to breathe. A guy with a trombone blared clarions calls for partiers, and people would shout, and chant to his reveilles. Someone getting a download by sticking his head in a hole in the stones – I guess. After about 45 minutes in the center of the circle, I made my way back out, and to my disgust, had to walk, trip, stumble over cans and paper dropped by “care-less” partiers. There was neither space to reach down, nor capacity to help clean up at this point. Outside the circle, thousands of people sat in the grass, stood around in little circles, or stood amazed at the sight. 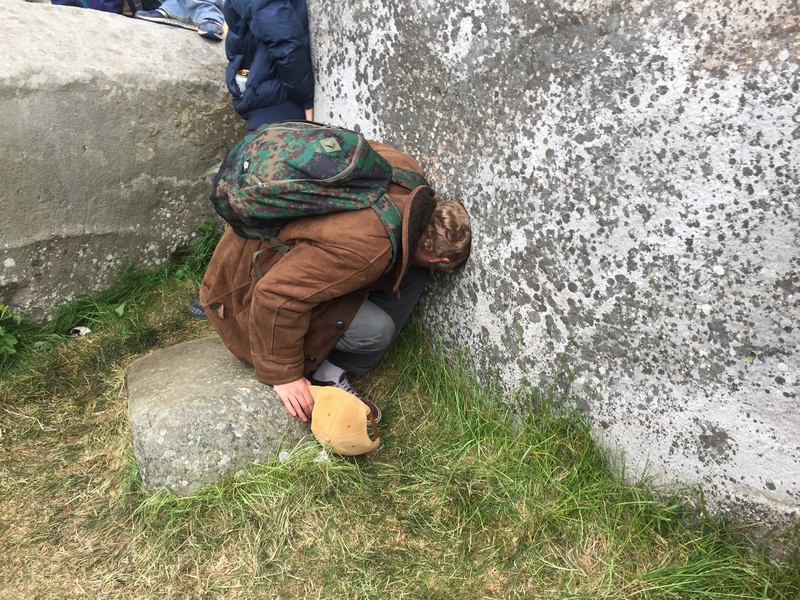 People were leaning against the stones, touching them with their hands, and asking their friends if they could feel anything. As the night drew to morning hours, people settled into blankets and sleeping bags they brought to wait warmly for the morning light. The number of partiers who over-indulged was a fairly large percentage of this population of Solstice revelers, and soon, making one’s way around the site was an adventure to avoid tripping over tripping hippies. Our friends from Cardiff (Charlie, Owain, Olivia, and Gareth) arrived before midnight, and added to the gentle family feeling this event tends to create. Dennis sat down with his little cardboard signs that read, “Free Dream Interpretation” and “Spirit Cleansing.” People were intrigued and interested in the idea of having their spirits cleansed, and Dennis talked with one person after another for a few hours. 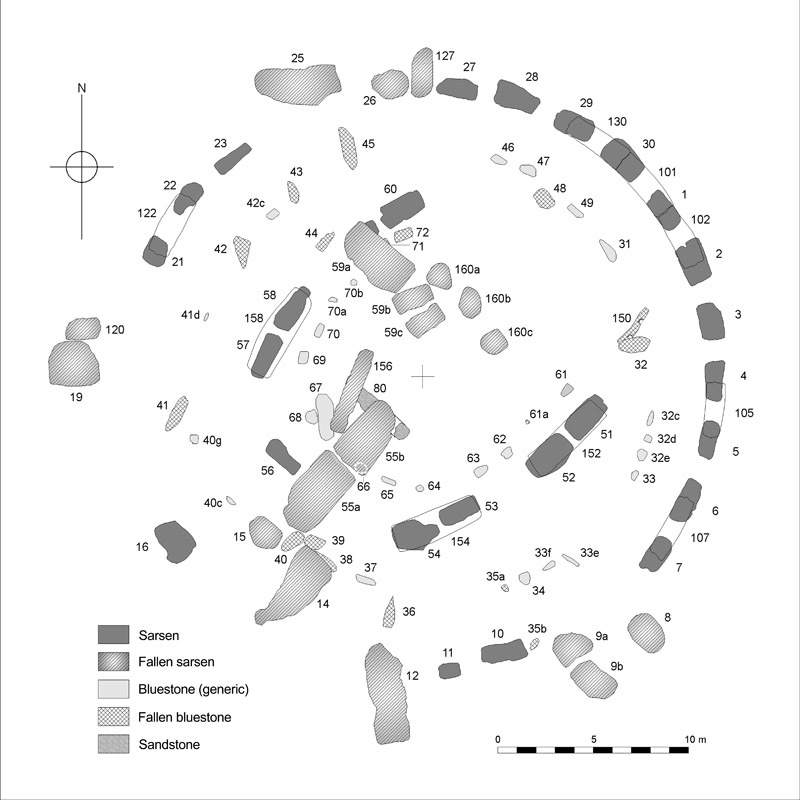 I sat down on a nearby fallen sarsen stone (stone number 12 on this map) outside the circle, and made friends. We smoked cigars together, and talked philosophy and theology through the night. Jide is a London born Nigerian DJ, who grew up in church, and has moved away from it over the years. Yet, he feels as though he has been called to be a healer. We discussed healing and bringing God and transformative spirituality into the EDM world. Jide is performing at Glastonbury under his performing name Ten Dai this week, and I am hoping I will be able to find a recording of that performance. Circles of people discussing theology and church would gather around from time to time throughout the night, and as the horizon began to lighten up, I made my way to the Heel Stone, which lines up with the rising of the Summer Solstice sun. Arthur Uther Pendragon, a Neo-Druid who calls himself the “battle chieftain” of the Council of British Druid Orders. He held a brief ritual just prior to the sunrise shortly before 5am. Already, shortly after sunrise (video in link), the mess left by the “care-less” parties was cleaned up by teams of volunteers with trash bags. 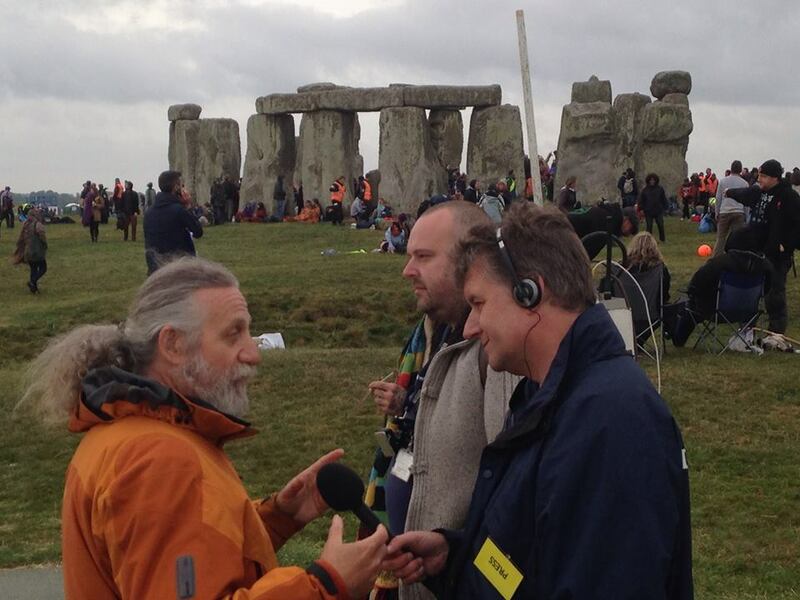 For the next couple hours I waited for a live radio interview with Wiltshire BBC’s Graham Rogers show. I met Arthur, who told me he needed gas money from the Pagan Federation to get to London a couple weeks later, and I thought to myself, that this all felt like a Monty Python skit. My fellow burner friend Amber Barger later wisely suggested I should have given him two coconut halves. 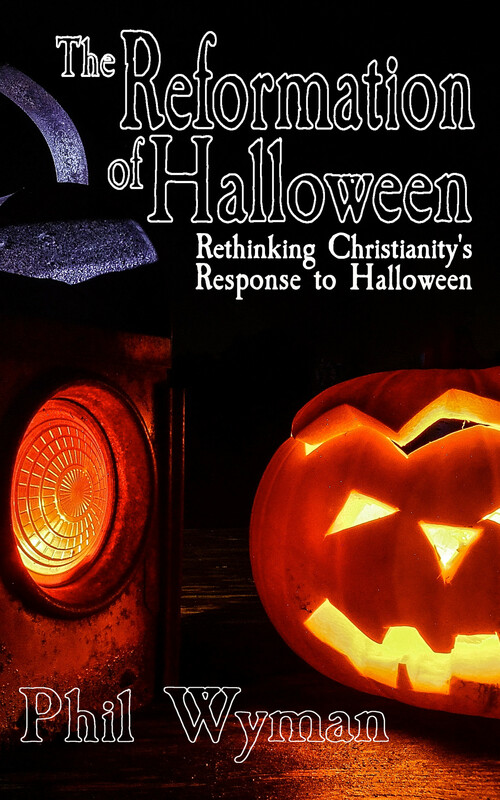 When the interview time arrived at 7:20am, Graham asked some simple questions about why was I at the stones, what it was like pastoring in Salem, MA, and what I would take away from the experience. You can find the interview for a limited time (about 4 weeks) on the BBC Wilthshire website. My interview starts around 2:51:30 into the show. You can pull the slider forward to that time to hear the 9 minute interview. 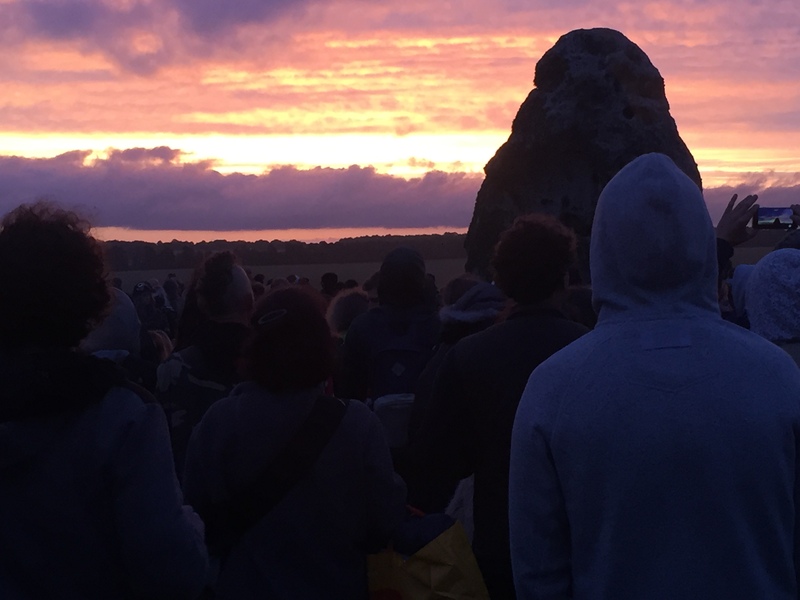 After the security gently pressed people away from the stones around 10am, we made our way to Charlie’s van, and spent the rest of the day, sleeping between trees in the woods in our hammock tents, and visiting the impressive stone circle at Avebury.